When it comes to Google phones, these two are among the best. The Moto X is the flagship smartphone of Motorola Mobility. It used to be owned by Google from 2012, but Lenovo recently acquired the company. The Nexus 5, co-developed by Google and LG is one of the best smartphones available on the market today offering high-end performance for a very good price. We want to find out which one is the best based on what they have to offer. Codenamed “X Phone”, the Moto X was designed for mainstream users, lending them the ability to custom-order the device in different color variations. The Moto X was praised by users for its hardware, performance, unique user experience and battery life. Its camera was criticized however, for having bad image quality and lack of some basic features. The Moto X has a simple design, with a soft touch finish. Thanks to the slim bezel around its edges the screen feels bigger and fills up almost all of the front side of the device. If you buy it in white make sure you also get a case for it. Thanks to the woven texture on it’s back cover it will capture every bit of dirt it comes into contact with, even the grease from your hands. If you want to order it in different color and personalize it with custom engravings, you can use the Moto Maker service on the manufacturer’s website. The Moto X comes equipped with a 4.7-inch Super AMOLED display @ 720p resolution and 316ppi. Thanks to its OLED technology it offers grate image quality and contrast levels. It also includes a 10.5 megapixel main and a 2.1 megapixel front camera. The camera app was custom built by Motorola which, although offers intuitive interface and features geo-tagging, touch focus, face detection, panorama and HDR, lacks optical image stabilization. The Moto X packs a 1.7 GHz dual-core processor using a Snapdragon S4 Pro system chip. It makes use of 2 GB of system RAM and comes with 16/32 GB internal storage depending on the model. Sadly, it has no microSD support so the internal storage can’t be expanded. On the connectivity side the Moto X comes with Bluetooth, Wi-Fi, GPS, NFC and USB support. Motorola changed very little on the Android 4.4.2 OS that comes with the device but the new features that were included make all the difference. One of these features is the voice control system. Using an on-board language processor, the device can be configured to recognize the user’s voice and respond to the phrase “OK Google Now” that will allow access to all of the Google Now’s and Motorola’s own voice commands. The phone is capable of listening to this phrase even when the screen is turned off. Another very useful feature is called Active Notification. This will wake the phone up, displaying any new notification on a special black&with lock screen. Thanks to the AMOLED display, the black color is rendered by switching off the responsible pixels and as a result conserve power. The Moto X includes a 2200mAh non-removable battery that should last more than a day, depending on usage. Thanks to the Super AMOLED display’s energy efficient design the Moto X is capable of achieving great battery life even with active usage. The Nexus 5 is a hugely popular device on the smartphone market. It has everything going for it, big screen, good specs and a very good price. Lets see how it stands up against the Moto X. Made out of a polycarbonate shell, the Nexus 5 looks similar to the Nexus 7. Like the Moto X it comes with a soft touch finish but with a flat back cover. It can’t, by any extent be called elegant but it feels solid and you don’t have to worry about it getting scratched too much. The Nexus 5 comes with a 4.95-inch IPS LCD display capable of 1080p resolution and 445 ppi pixel density. It sports an 8MP main camera which because of its buggy camera app could not deliver its full potential. The Android 4.4.2 update fixed many bugs including the camera app’s and as the 4.4.3 update is already rolling out, the Nexus 5 should become more stable than ever. The main camera’s features include touch focus, face detection, photo sphere, HDR, dual recording and it’s capable of capturing 1080p videos. It also comes with a 1.3 MP secondary camera. The Qualcomm Snapdragon 800 chip, 2.26Ghz quad-core Krait 400 processor and 2GB of RAM are more than enough for today’s apps and games to run lag free on the Nexus 5. 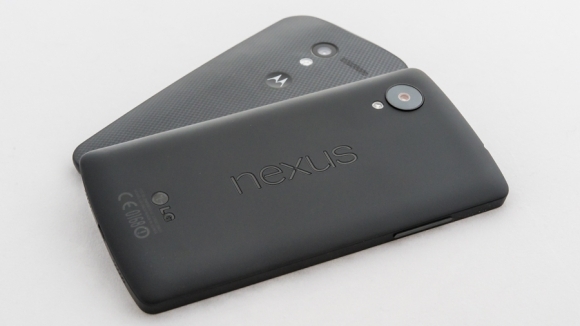 Depending on the model, the Nexus 5 ships with 16 or 32GB of internal storage, with no microSD support. Connectivity options include Bluetooth 4.0, Wi-Fi, micro USB, GPS, GLONASS and LTE. The Nexus 5 initially ran on Android 4.4 but Google made sure it receives all the new updates it has to offer to keep it compatible on the market. The new Android 4.4.3 update is currently rolling out for all Nexus models so you don’t have to worry about it getting outdated any time soon. The Nexus 5 uses a 2300mAh battery which should be enough to power your device for a day but some users are complaining that the battery drains in just a few hours. The Nexus 5’s battery life is expected to get better with the new Android 4.4.3 update, which should bring better optimization to the OS making it less of a power hog. The only factor we haven’t talked about is the price. You can pick up a Nexus 5 for around $500, maybe even less depending on store discounts. The Moto X is a bit cheaper, costing around $450 carrier free. Taking all the facts into consideration the choice between the two may come down to what you are after. If you want a bigger screen then go with the Nexus 5. If you want good battery life then go with the Moto X. The list could go on… The Nexus 5 may have the better hardware but the Moto X brings so much more to the table, with its unique features and intuitive design. No matter which one you end up with you can’t really go wrong on either of them. If we would have to pick however, we’d go with the Moto X simply because it offers a better value factor. Tech enthusiast and RPG gamer, I've been surrounded by technology and PC hardware my entire life. I'm fascinated by anything mobile, and when I'm not tinkering with some newly released gadget, I love to immerse myself in the epic tales of Role Playing Games.